Tencent files trademark applications, presumably in response to Twitter launching new “Moments” feature. 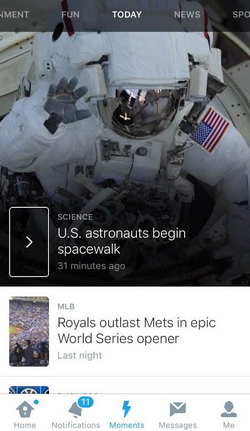 On October 6, Twitter launched “Moments” in an effort to attract more users to trending topics. It’s a pretty cool feature, but Twitter might run up against Chinese social networking giant Tencent over the name. Tencent has a number of services including microblogging. On October 16, Tencent filed two trademark applications with the U.S. Patent and Trademark Office for “Moments”. One was filed for services already in use, claiming a first-use-in-commerce date of 2012. The fields of use are fairly limited but certainly clash with Twitter. The other was filed as an intent-to-use application, also claiming foreign priority, and covers a laundry list of activities including social networking. I can only assume Tencent filed these trademarks in the U.S. as a reaction to Twitter launching its Moments feature. It certainly looks like this could cause an issue down the road.